There has to be an easy way to get light themed styles, right? I couldn’t find one, but I did find a way to easily create them. The resources and styles used by controls within the app are generally not found within the app itself. The app requests a theme from the system and that theme has all of resources and styles This allows you to create custom controls and use those brushes and have the control be styled properly for both light and dark themed apps. Because these resources are not available to us, we’ll need to create our own. Name the style LightThemeButtonStyle and place it in the current document. 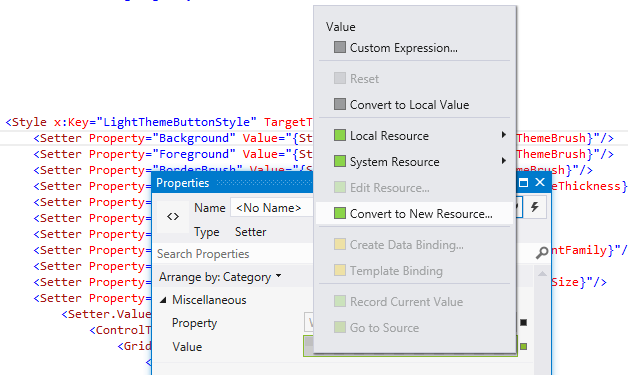 For some of the steps it will be easier to have the style in the age and then cut/paste the style into LightStandardStyles.xaml. Now for the tedious part. We need to create new brushes that will replace the existing brushes. 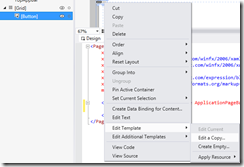 This is really easy to do using Visual Studio or Blend. 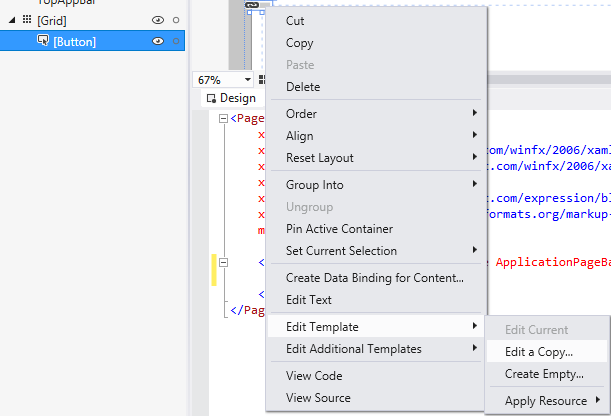 While viewing the xaml, scroll through and find a brush. The first one is going to be the background of the button itself. This allows you to create a local copy of the resource. 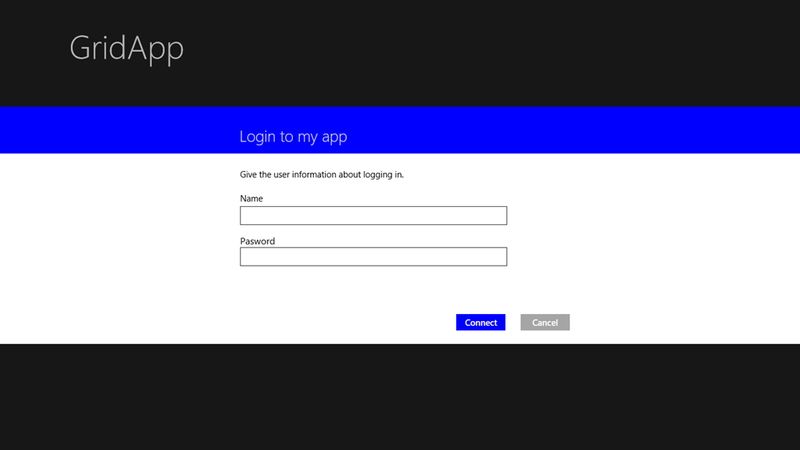 Name the style LightButtonBackgroundThemeBrush and this time do place it in LightStandardStyles.xaml. Now you are on a rinse/repeat cycle. Follow the following steps for each of the brushes in the style. You can use these steps for every brush except for the brushes used in the states. Do not use these steps for brushes that use TemplateBinding, only the ones that use a StaticResource. During this process, you may encounter a message stating that changing the style will remove a visual state style. I never confirmed whether this actually did remove the state style, but to be safe I cut the style out of the template and pasted it into another file. Now we need to get the brushes changed for the different visual states. This is where having the style in the page will pay off. If you removed the states, now is the time to paste them back in. In your page add a Rectangle. Now go to your visual states and find a state that changes a brush (eg: PointerOver changes the Background property of the border to ButtonPointerOverBackgroundThemeBrush). Copy the resource and place that as the Fill for the new Rectangle. Now that you have the brush being used, you can follow the follow the six steps above to change all other resources in the file. Rinse/repeat this cycle until all of the brush resources have been updated. 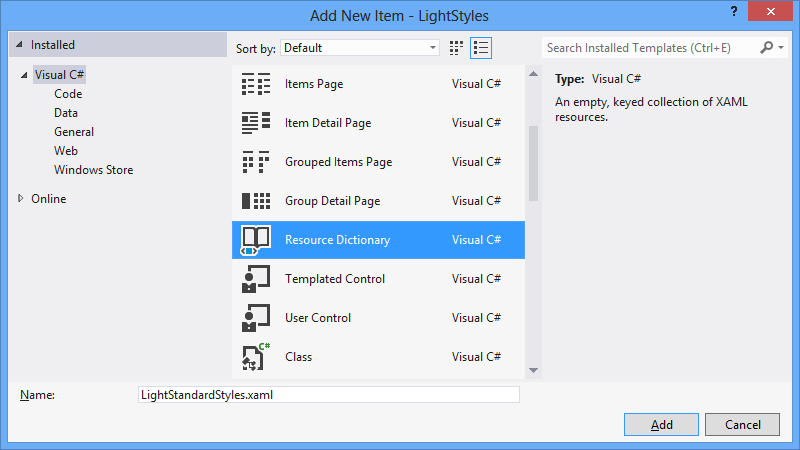 Now you can cut the resource out of the page and paste it into LightStandardStyles.xaml. This does sound tedious, but you can create a light style pretty quickly. But today, and today only, you can download the light styles that I created. This resource file has light themed styles for the ToggleSwitch, TextBox, ComboBox, Button (including a LightAppBarButtonStyle) and all of the standard TextBlock styles.